My New Kindle Book + Horror Game Hybrid Is OUT NOW! One afternoon in May, I was steamrolled by one of my more hair-brained ideas that just seemed so weird, crazy, and exciting that I couldn’t NOT drop what I was doing and figure out how to make it happen. I decided to make an interactive fiction dungeon crawler game on PC using Twine. 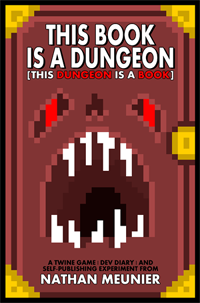 Then I decided that I’d only release the game INSIDE a Kindle book on Amazon. Then I decided that the book would also be a massive diary documenting the ins and outs of the entire project. The whole thing? One big wacky experiment that mashes-up self-publishing with indie game development and DIY creativity. Boom. And I gave myself a little over a month or so to complete this ridiculous task. But beyond the branching paths, grisly deaths, gruesome situations, and eerie puzzles woven throughout the short, freaky game itself, I think the book portion of this project and the whole experiment is equally interesting. If you’ve ever been curious about writing interactive fiction, making and releasing games independently, doing crazy creative things on a stupid tight timeframe, and generally trying something new and exciting you’ve never done before, I think you’ll get a lot from the 40,000 ish words I cooked up while making this unholy concoction. In any event, the book and game are officially available. They’re not perfect (I wasn’t aiming for perfection with this experiment), but I feel super psyched about how they all spun out, and I’m inspired to tackle more interactive fiction projects in the future. I’m also updating them almost daily based on player feedback and to stomp any minor bugs folks find. A paltry $5.99 Kindle book purchase scores you access to both the game (playable via a HTML edition or a standalone PC edition, with a Mac standalone version coming soon) + the book that documents the utter insanity of tackling this thing over the course of three months. Seriously. I hope you enjoy it as much as it nearly killed me to create it! Nathan, I have a few issues with the book. Rather than writing a bad review, I thought I would address them here and see if you could address them. 1. When I went to the ‘play the game’ part of the book, it crashed the Kindle app (this is on an Android phone). 2. When I try playing the game (using Firefox on an Android tablet), it gets to the check that the protagonist is alone (on the train) and then just loops. Also (1) the Kindle app was on an Android tablet actually (a Samsung). 3. if I try skipping to the dungeon, I get errors (a) an aletrt about an unterminated string and (b) text in pink “no macro or passage called replace” (etc). I can play it ok on Firefox on my Fedora PC, except I keep dying. Hi Martin! Thanks for reaching out! Playing the browser version on some different devices is a little dicey, because different devices handle things differently and they don’t all support the same way. While I believe it’s technically possible to play the game right on your tablet by clicking the HTML file, a lot of browsers get funky when you try to do that and will throw errors. Generally speaking, for the HTML version, you’ll get the best performance (and you shouldn’t have those weird errors) by playing the HTML version by downloading it and using a Chrome browser on Mac or PC to play. But I am glad you did get it working (Dying is a core component of the game, as there are 20-30 different gruesome deaths woven throughout the experience. It’s a short game designed for high replay due to the large number of potential outcomes of each section, and experimenting to figure out what’s required to avoid death and proceed is a big part of things. Have you tried playing the standalone PC version instead of the HTML file? It’s included in the folder. Playing that version should cut down on any strange browser-centric errors. I’m working on getting a standalone Mac executable created, though it may be a little while before I iron that out. Also, RE: the Kindle app crashing, I’ve had some Samsung table users report funky issues in the past with some Kindle books crashing. Are you able to read the book ok and does it only crash when you try to jump to that section, or does it prevent you from reading the book too? Let me know, and def ping me via email too, so I can try to sort if out either way. Could be a simple fix or a problem with the particular device compatibility with the HTML coding. It seems onlt to crash when I go to the ‘how to play the game’ page. I’ve been able to play the HTML version of the game on a Linux PC, but not on an Android tablet. Presumably the “PC” version only runs on Windows.